The A List: What Diva? Hollywood's most photographed offspring will remain the apple of her parents eye, at least for another few years. Suri Cruise, the four-year-old fashionista and tabloid darling extraordinaire, may not get the chance to be a big sister after all. In the October issue of Marie Claire, Katie Holmes reveals that contrary to previous reports, she and husband Tom Cruise have no plans to expand their brood. The holy Hollywood trinity, who spent their summer in Toronto while Katie filmed The Kennedys, will remain their close knit unit. 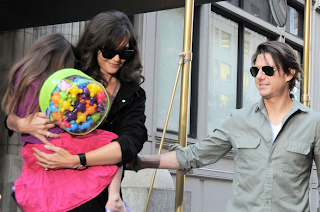 "Maybe in a couple of years, but right now I want to make sure I'm really there for Suri," said Katie. I can't say I blame Tom and Katie for wanting to hold off on adding to their brood (which includes Tom's children with Nicole Kidman, Isabella and Connor). It seems that Suri is permanently attached to them and another child would only take away precious time with their little girl. After all, Tom may not want to etch another name on his Nike shoes! Katie also dispels any diva rumors by claiming that Suri can't function without completing her chores in the mornings. "We wake up and we do the same thing. She does her chores. If she doesn't get her chores done, I notice she's not really herself. She has to make her bed, she has to take her dishes to the sink, she has to put her clothes in the laundry - you know, that basic stuff." Her designer outfits must be giving us the wrong impression, because Katie's description of a typical chore-filled morning makes Suri sound more mature than any other four-year-old I know. As for me, I'm 23 and I still have a hard time making the bed in the morning and cleaning my dishes. Boot camp at the Cruise house, anyone?